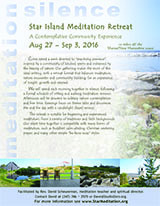 Come spend a week devoted to “practicing presence”, inspired by a community of kindred spirits, and enlivened by the beauty of nature. Our gatherings make the most of this ideal setting, with a retreat format that balances meditation, nature encounter and community building, for an experience of insight, growth and renewal. We spend each morning together in silence, following a formal schedule of sitting and walking meditation sessions. Afternoon is devoted to solitary nature-contemplation and free time. Evenings focus on theme talks and discussion. Evenings focus on theme talks and discussion. This retreat gathers adults of all ages, old friends and newcomers, beginning and advanced in experience, from many traditions and faith backgrounds. Our silent time together is compatible with many forms of meditation, such as Buddhist calm-abiding, Christian centering prayer, and many other simple “be here now” styles. Read more about our schedule and past participants’ experiences. Led by Rev. David Scheuneman, meditation teacher and spiritual director.